2x Windows NT Workstation 4.0 OEM packs containing NT4 installation CD (for x86, Mips, Alpha, PowerPC), boot floppies, service pack CD, registration card, and manual with COA and serial code on front cover - packs are still sealed in shrinkwrap. Interested in the NT4 OEM Packs in particular, But as for the Price, i have no idea where to start. Im happy for you to name a price and if i think its reasonable ill buy one. Yeah, 2000 Server still seems to fetch a pretty high price so I thought I'd see if I can get a good price for it If no-one bites I'll try it again next week a bit lower. Yey, someone just bought the copy of 2000 Server! Congratulations for the nice profit! 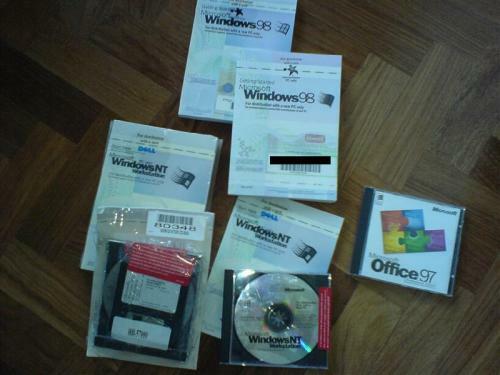 1x sealed complete NT 4 Workstation pack and 2x Windows 98 licences still available; other items are now gone. I may take a NT4 Workstation pack, PM me. lmao, I have the same NT Workstation disk, it's sealed I never opened it. LOOK AT THE DATES. The last post was over two years ago; it's probably all gone.